I decided it would be a good opportunity to do a quick tutorial on one of my essential rotary cutting tools. The Tucker Trimmer® makes constructing accurate quarter-square triangles a breeze. 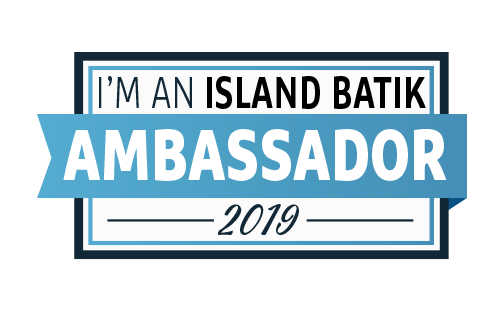 For the record, I am not affiliated with Studio 180 Designs, just an enthusiastic devotee of the Trimmer and several other tools Deb Tucker has designed. 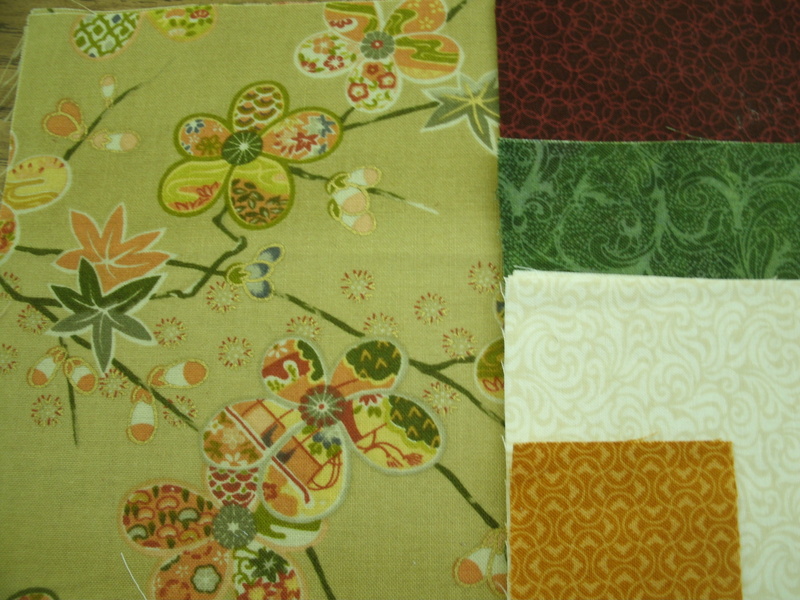 To make the Time Shift pattern, I started with four 4.5″ squares each of blue, green and cream Island Batik fabrics. Note: The Tucker Trimmer formula is simple: Take the finished size of your QST, and add 1.5″ to determine the size of your beginning squares. Cut each square diagonally twice, to make four triangles from each square. 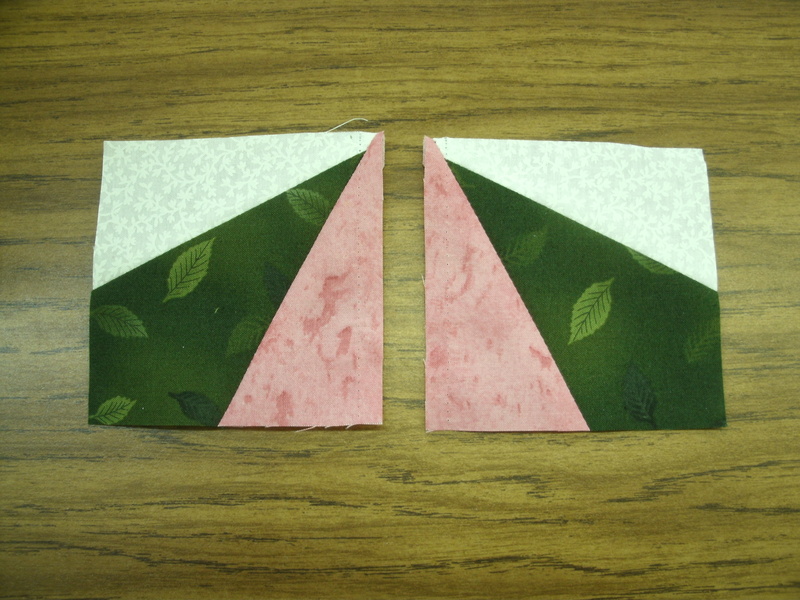 Rearrange the triangles and sew into three combinations as shown. Make four of each combination. I press my seams open. Press to the darker fabric if you prefer. Lay the Tucker Trimmer on your square, with the solid diagonal line along the SW-NE seam line. 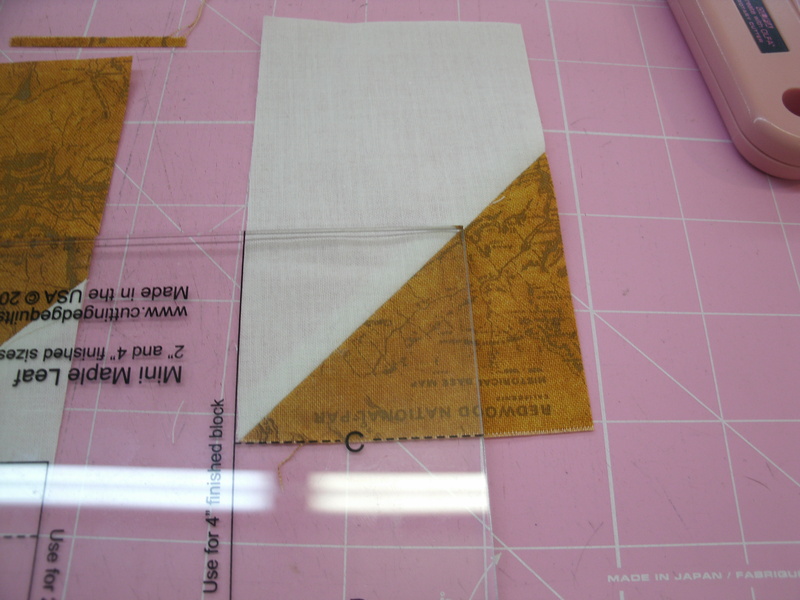 I’m cutting 3.5″ QSTs, so you’ll notice I have the dashed diagonal line labeled “3-1/2″ lined up with the NW-SE seam line. The left and lower edges of my square extend just a little beyond the 3-1/2” dashed vertical and horizontal lines on the Trimmer. Trim the right and top edges. Now rotate the QST, and lay the tool down again, aligning the same diagonal lines with your seam lines. Notice that the left and lower edges now line up with the 3-1/2 dashed vertical and horizontal lines. You now have a perfect 3.5″ QST, with no dogears to trim later! Trim each of your QSTs. Lay your QSTs out as shown. Sew into three rows, then sew the rows together into a block. Your block should be 9.5″ x 12.5″. I had a 16″ pillow form, so I added 2.5″ x 9.5″ (cut size) strips to the ends of the block, and 4″ x 16.5″ strips to the top and bottom. I did not quilt this pillow cover, in the interest of time. I may go back and do it later. For the back, I cut two 12″ x 16.5″ rectangles of the cream fabric. I hemmed on long edge of each rectangle, the pinned them wrong-sides-together, to the pillow top, so that the hemmed edged overlapped. I sewed all the way around the perimeter of the top, then trimmed the corners and turned it right-side out and stuffed the pillow form inside. My second Layer Cake® quilt pattern for Moda Fabrics has posted on the Moda Bake Shop blog. It’s called “Stargazer“, and I made the sample quilt with 10” squares from the new 30’s Playtime 2017 collection, paired with a royal blue Bella Solid, also by Moda Fabrics. The Stargazer quilt is 64″ x 84″ as shown, which includes a 4″ solid blue border across the top of the quilt to give it the length I prefer for a twin bed quilt. That border also gave me an opportunity to include a practical feature that I have only seen once, on a vintage quilt in an antique shop. It was a strip of muslin folded over the top edge of the quilt and basted in place. There was a row of daisies embroidered along the bottom edge. I wish I could have purchased the quilt, or at least taken a photo of it. When I described it to her, my Grandma Wiens explained that the muslin strip was a “bib” or a “whisker guard”. If your quilts are used as blankets, as mine are meant to be, they are most likely to become soiled along the top edge by body oils and/or worn through by whisker stubble as they get tucked up under chins on chilly nights. Can you imagine trying to launder a quilt by hand, or even in a wringer washing machine? So, Grandma explained, she would baste a strip of muslin over the top edge of the quilt. Instead of washing the whole quilt, she only had to snip the basting thread, pull the “bib” off, launder it, and baste it back into place! I did a little online research and found another form of quilt bib. This one was a sort of long, narrow casing that slips over the top edge of the quilt. To make mine, I purchased 5/8 yard of one of the fabrics in the 30’s Playtime 2017 collection. I cut one 8.5″ x 40.5″ strip and two 8.5″ x 13″ strips, then sewed the shorter strips to the ends of the longer strip. Hem the two long edges. I used my rolled-hem foot. Going over the seams was a little tricky, but if you go slowly and use a stiletto, it is a nice finish. If you don’t have a rolled hem foot…or aren’t on speaking terms with it…you can cut your strips 9″ wide and turn under a quarter-inch and a quarter-inch again, press and sew with a straight seam. Next, I sewed the lace along one long edge on the right side of the piece to hide the basting stitches that would fasten it to the quilt, and keep them from snagging little fingers. Then I folded the strip in half lengthwise, right sides together, and sewed the ends. Be sure to backstitch the ends of the seam. I added a second seam for strength, but it really isn’t necessary. Trim the top corner and turn the piece right-side-out. Slip the casing over the top edge of the quilt, and baste in place. I used approx 1″ basting stitches, tucked under the edge of the lace. Be sure you baste through both sides of the casing, the entire length of the quilt. Of course, there are other options for attaching the bib to the quilt. 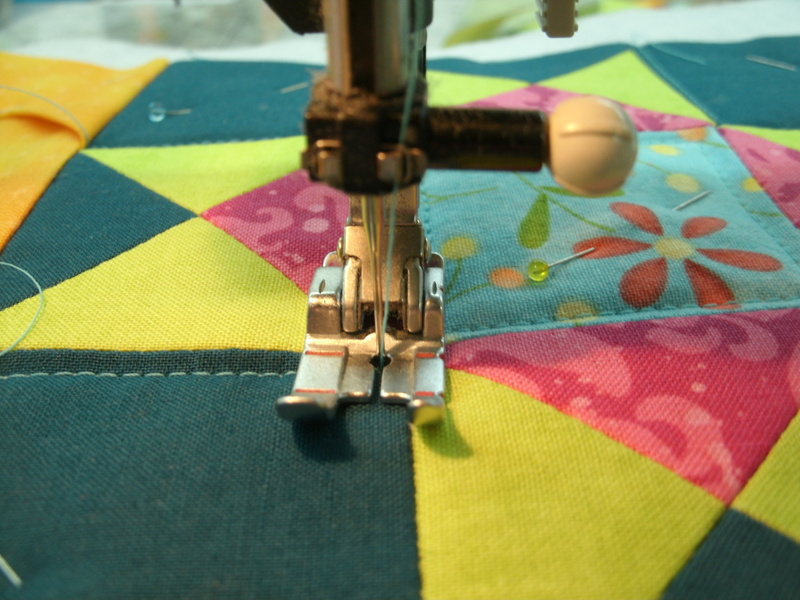 You could sew several buttons at intervals along the border of the quilt, and button holes on the casing. Remember you will need them on both sides of the quilt. A row of snap tape front and back would also work. I don’t expect quilt bibs to come back into vogue anytime soon, but it was fun to take a step into history for this project. 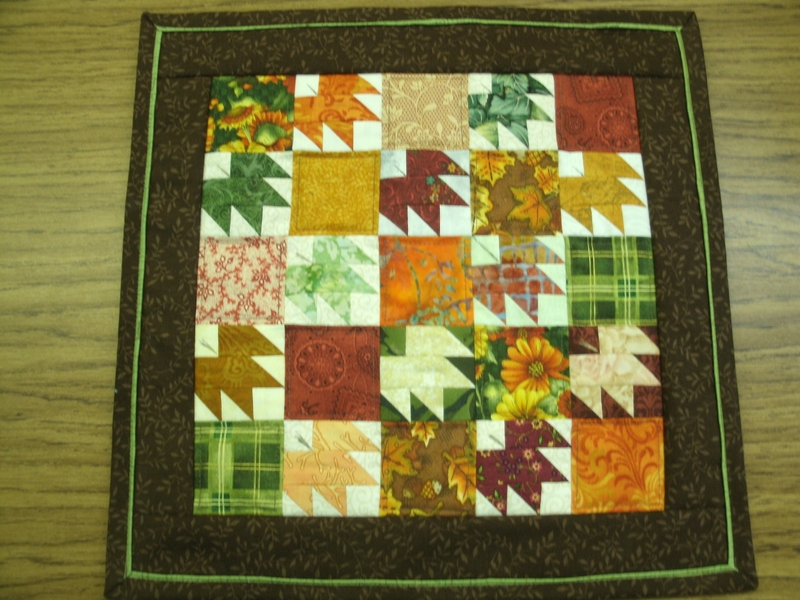 One 4.5″ square (brown) for the center. One 6.5″ square (blue) for the backing, and four 3.5″ x 6.5″ rectangles (blue) for the frame. Note: You can use narrower frame strips and a larger center square if you prefer. One 6.5″ square of scrap batting. Thread should match your frame fabric. 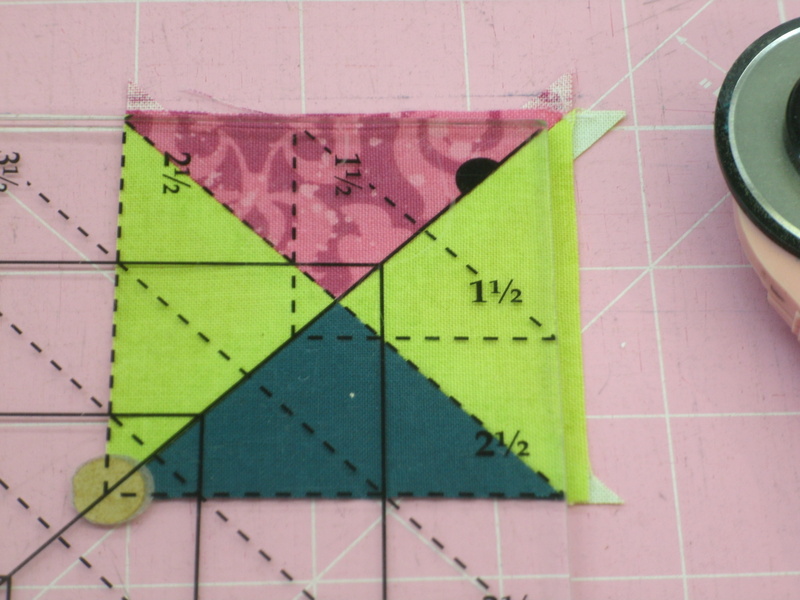 Step 1: Press the 3.5″ x 6.5″ rectangles in half lengthwise, wrong sides together. Lay the batting square on the table and lay the 6.5″ backing square on top of it, right side up. Lay the framing strips on the square as shown, as if you were closing the flaps on a cardboard box. Raw edges are on the outside. 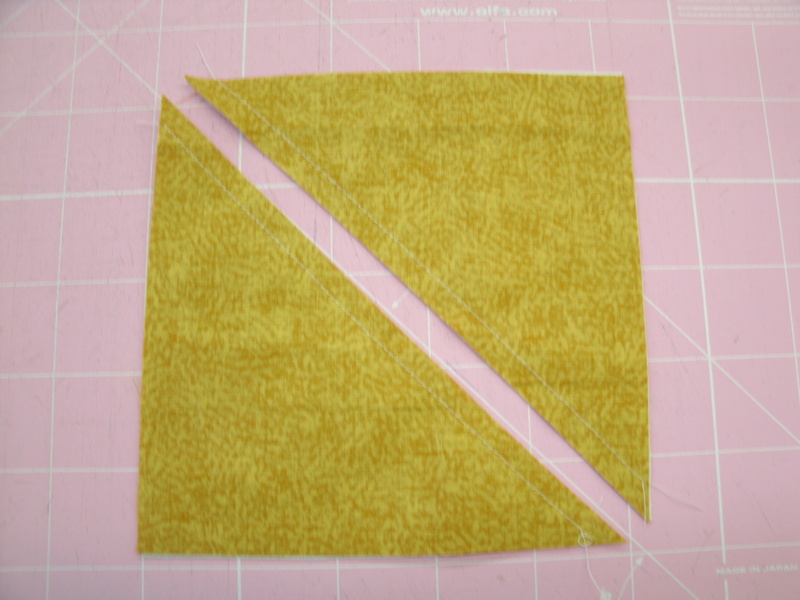 Sew a 1/4″ seam all around the outside edge and trim the corners. Flip the frame strips to the batting side of the piece. 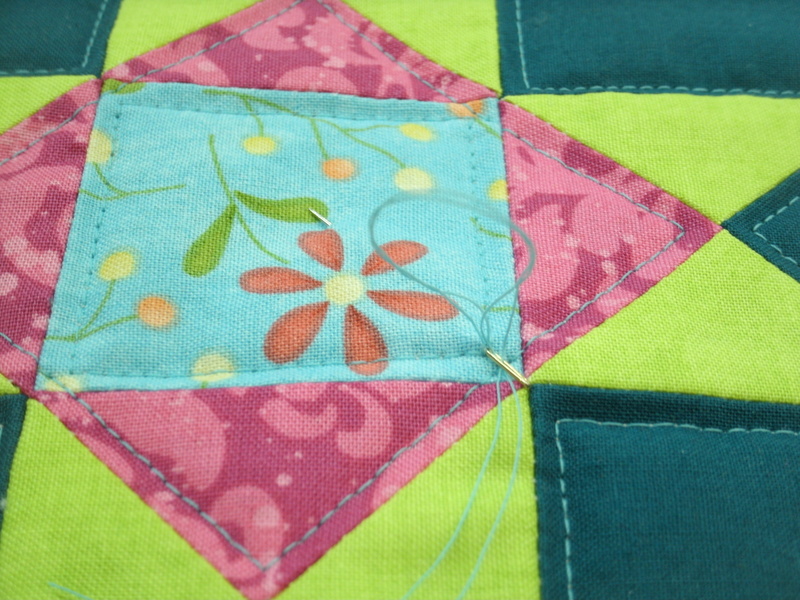 Poke the corners out as squarely as possible, and top stitch 1/4″ from the edge. Insert your 4.5″ square. Pin in place and stitch the frame edge down close to the center square. 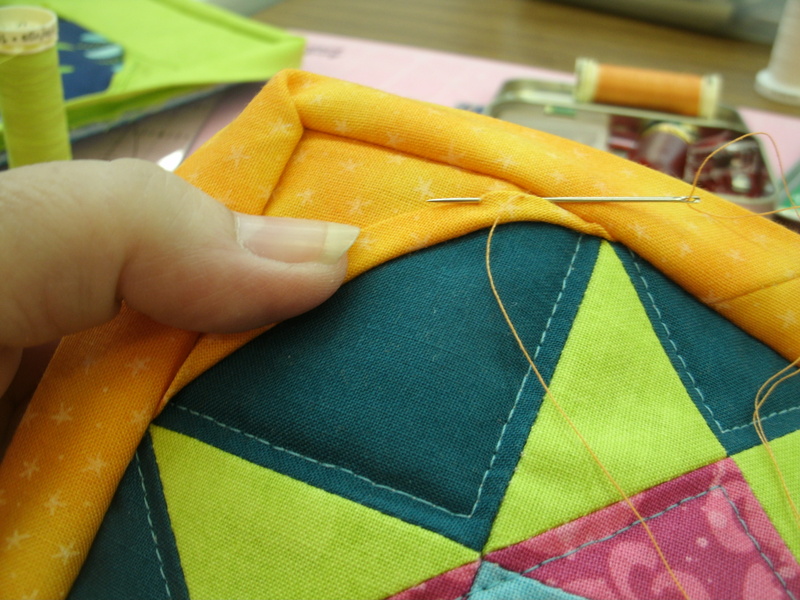 When I’m top-stitching, I don’t like to back-tack the end of a seam. Instead, I leave myself a good 4″-6″ of thread, and using an embroidery needle (because it has a larger eye), I bury the thread ends inside my piece. There! Now how easy was that? I saw another great idea the other day. Same general idea – use binding leftovers, cut to 6.5″ lengths as your framing pieces. 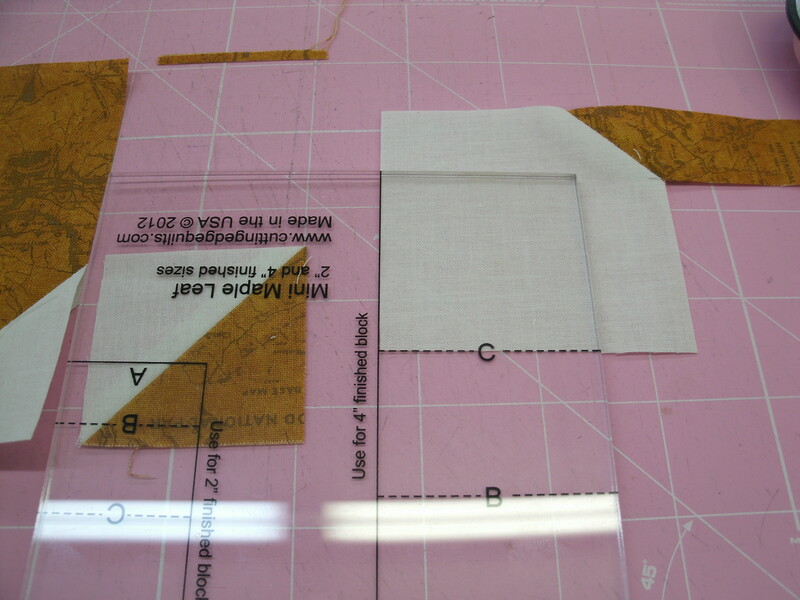 Sew and flip as show above, but instead of inserting a small fabric square, just leave the batting exposed. Set it next to your machine and it’s a thread catcher! So simple, you’ll want to make one of each for your quilting pals. We’re Up to Volume 11, and my contribution to this collection is “Telstar”. 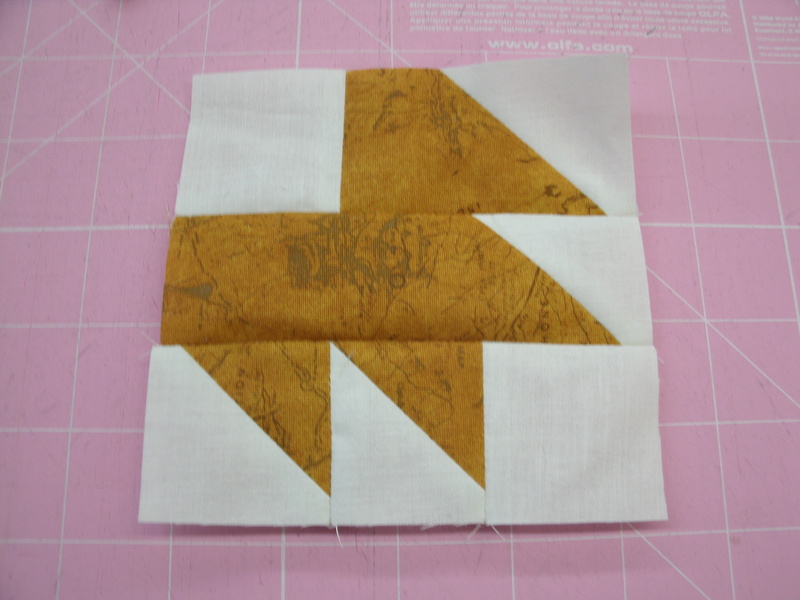 In 100 Blocks the editors gave you templates for paper-piecing this block. 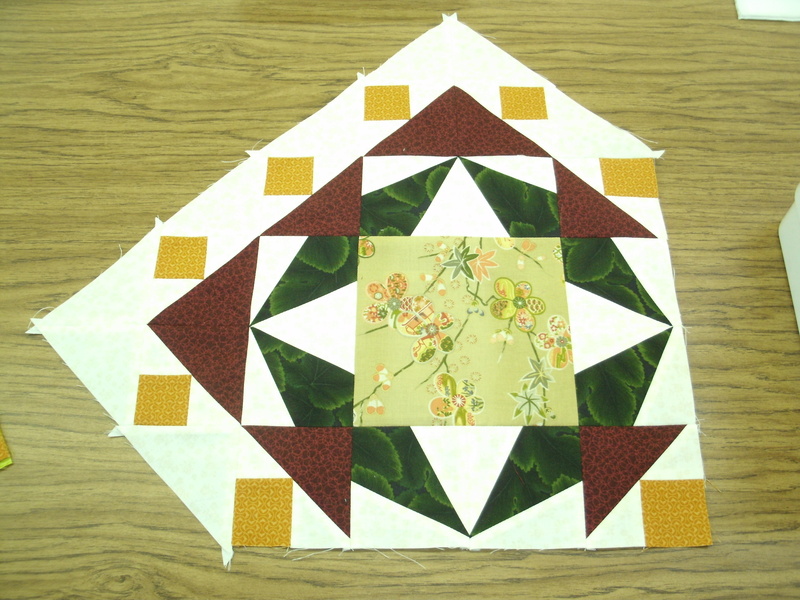 I pieced mine, using two of my favorite rotary cutting tools – the Tucker Trimmer® and Center Beam® tools from Studio 180 Design. If I had named the block before I made it, I probably would have used a space-themed fabric in the center square. The truth is, I have an awful time coming up with titles for my designs. It just happened that I was reading an article about the early days of the US-USSR space race the day before I absolutely had to get this block in the mail. There was a photo of the Soviets’ Sputnik satellite and the American satellite Telstar. Honestly, the block looks more like Sputnik, but I liked the Telstar name, so it stuck. So, off Telstar went to Quiltmaker, and I began playing with projects built around the block. I did make a cute little quilt with an astronaut print, which I will save for another blog post next week. Both tablerunners have 3 Telstar blocks set on point, with pieced triangle units. I made a little change in the block in the “pink” tablerunner. More about that later. The tablerunners measure about 18″ x 52″. You will need to make three Telstar blocks, according to the instructions in the magazine. For the setting triangles you will also need to make twenty of the corner (red & gold) units, and eight 3.5″ blue/white half-square triangles. 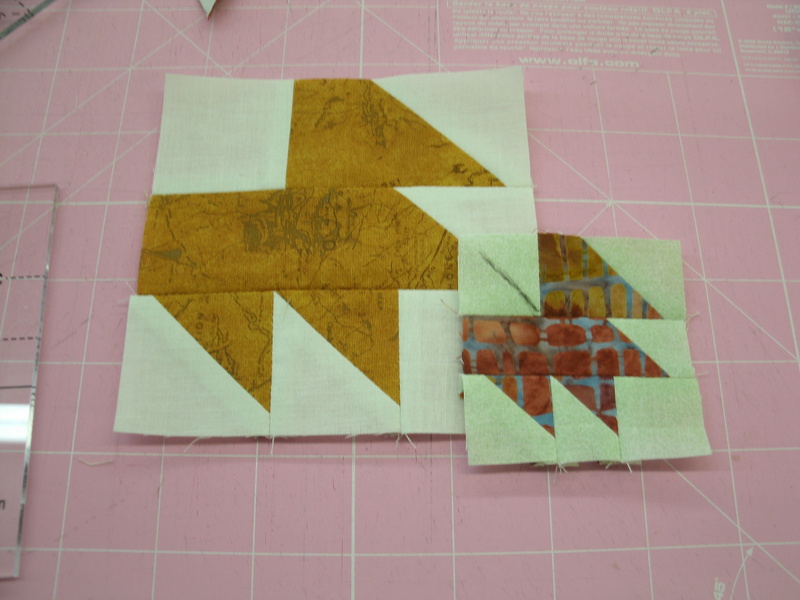 Cut eight 5.5″ white squares, and cut each diagonally twice for 32 quarter-square triangles. You also need four 3.5″ squares of your main print. You may notice my green squares are missing one corner. I was determined to use this print in my tablerunner and I was down to my very last bits of it. I was not at all sure I was going to make it! 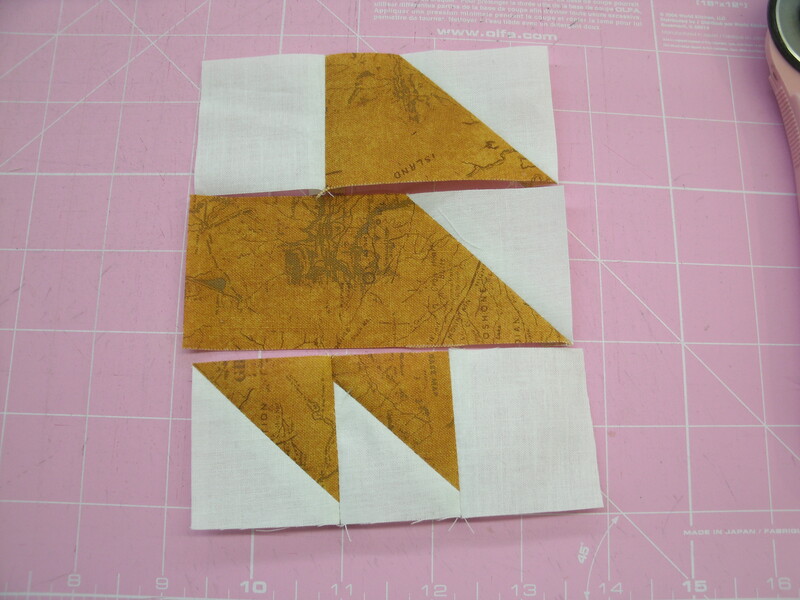 Sew white triangles to the remaining red and gold units and sew into 4 pairs. 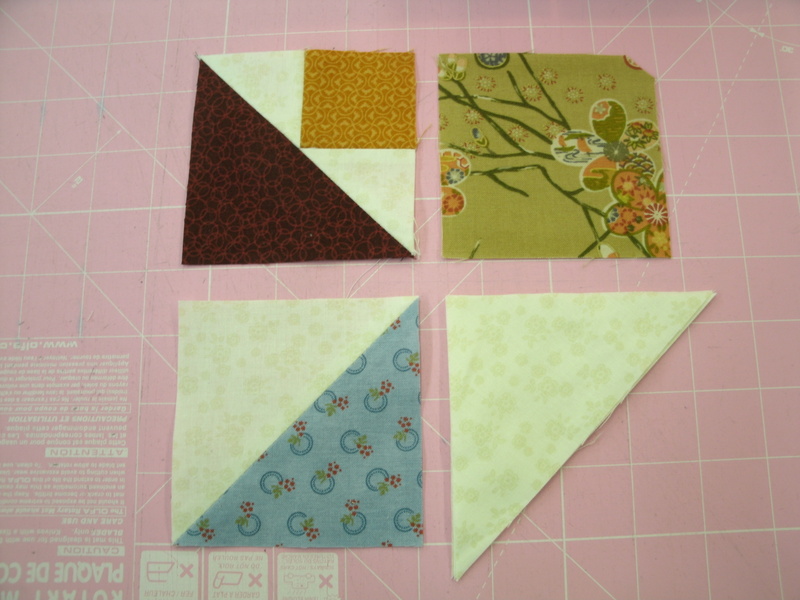 Sew a setting triangle to the right side of each of the end units. 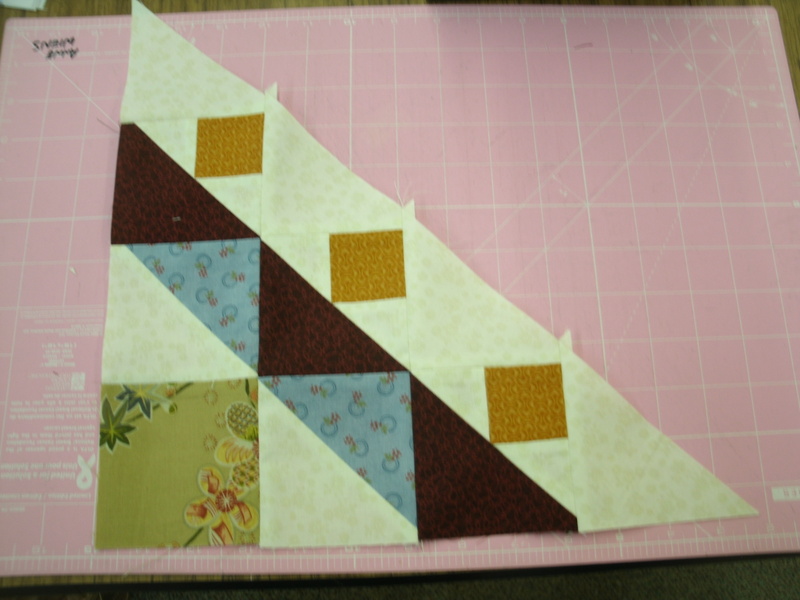 Sew the other two setting triangles to opposite sides of the remaining Telstar block. 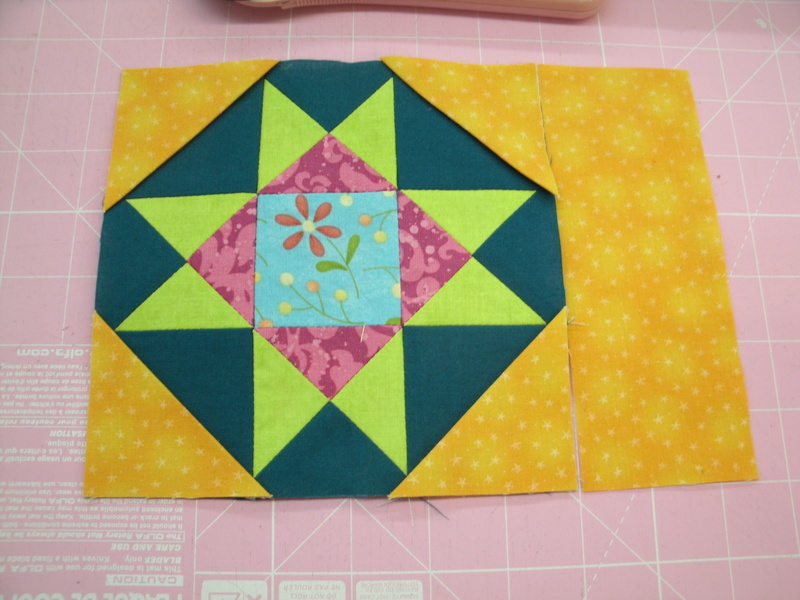 Lay the center and end units out as shown and sew together to complete your Telstar top. 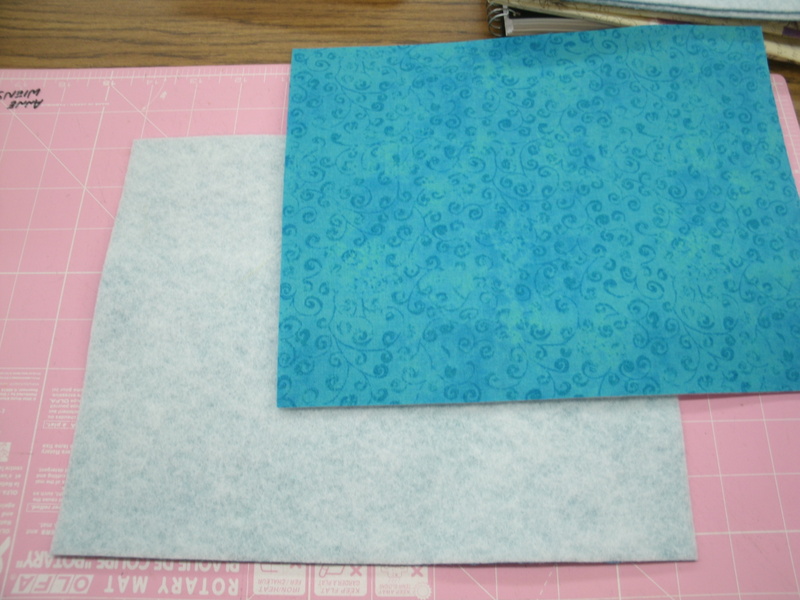 Use the dark blue fabric for backing and binding. 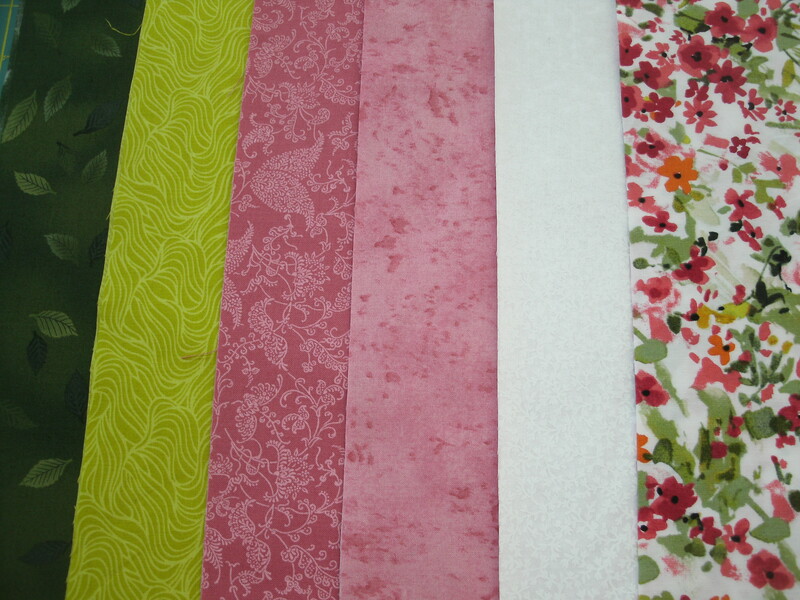 Cut five 2.25″ (2.5″ if you prefer) x Width of Fabric strips, sew end-to-end and press in half lengthwise for your binding. Set aside. 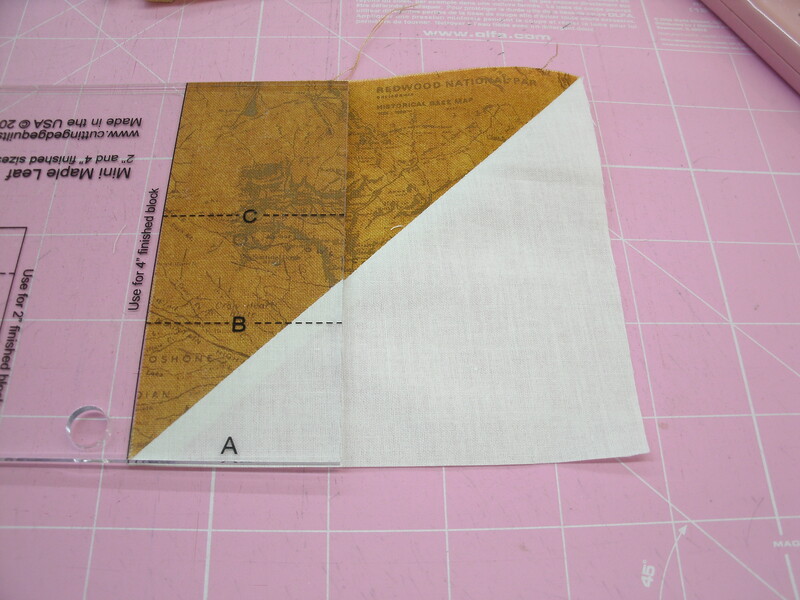 Cut the remaining 3/4 yard piece in half along the center fold and sew the two halves together end-to end. 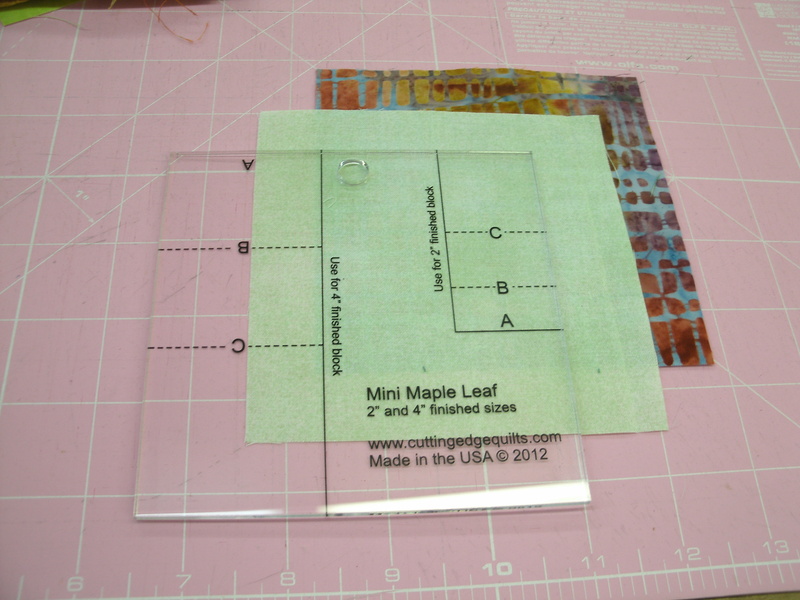 Your backing piece should measure approx 21″ x 56″. Layer the top, batting and backing, quilt as desired and bind. Because I wasn’t certain I had enough of the green main print to make my first tablerunner, I bought fabric for a second. When I was sure I was “safe” with the first one, I tweaked the pattern a little for the second one. 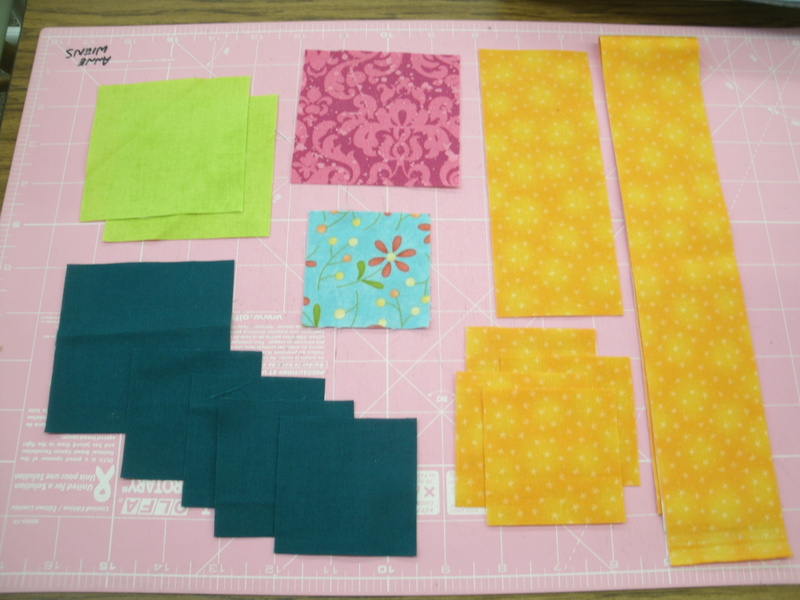 In the second tablerunner, I substituted a medium pink for the light blue HSTs, and used the green from the “point” units in the block for the binding and backing as well. I also put a light pink in place of some of the white pieces in the point units. In half the pink was on the left side of the green and in half it was on the right side. It’s amazing what a difference the one little change makes in the finished block! Thank you for visiting “Seams Like a Plan”. “Like” my Facebook Page or click the “Follow” button above to be notified whenever a new post appears here. Click on the magazine to return to Quiltmaker’s blog and continue the tour. 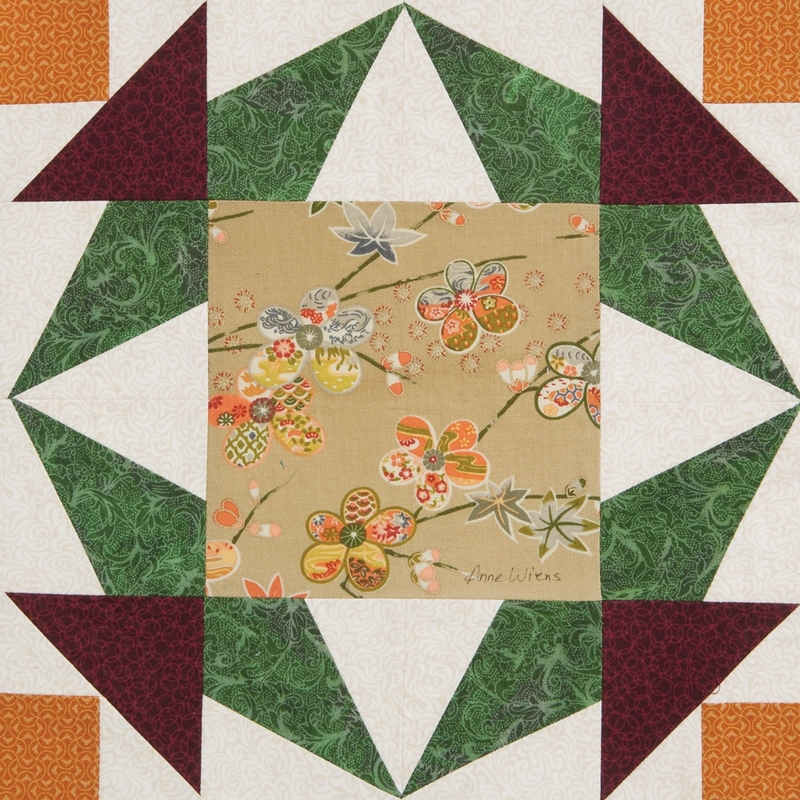 Leave a comment below to be entered in a drawing for a free copy of Quiltmaker 100 Blocks, Vol 11. It’s a random drawing, so gushing flattery won’t get you extra points…but it will make me smile. 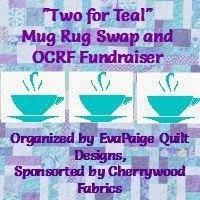 September is Ovarian Cancer Awareness Month, and each September, Beth Helfter of EvaPaige Quilt Designs hosts a fund-raising mug-rug swap she calls “Two for Teal”. 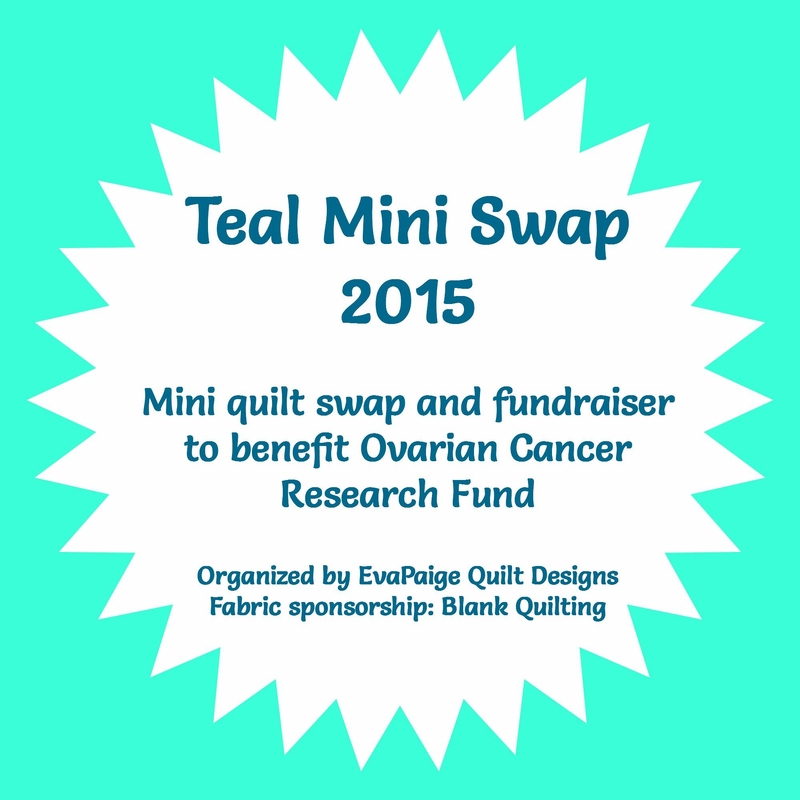 In return for a donation to Ovarian Cancer research, Beth sends each participant a swatch of fabric. This year it was a hand-dyed teal provided by Cherrywood Fabrics. 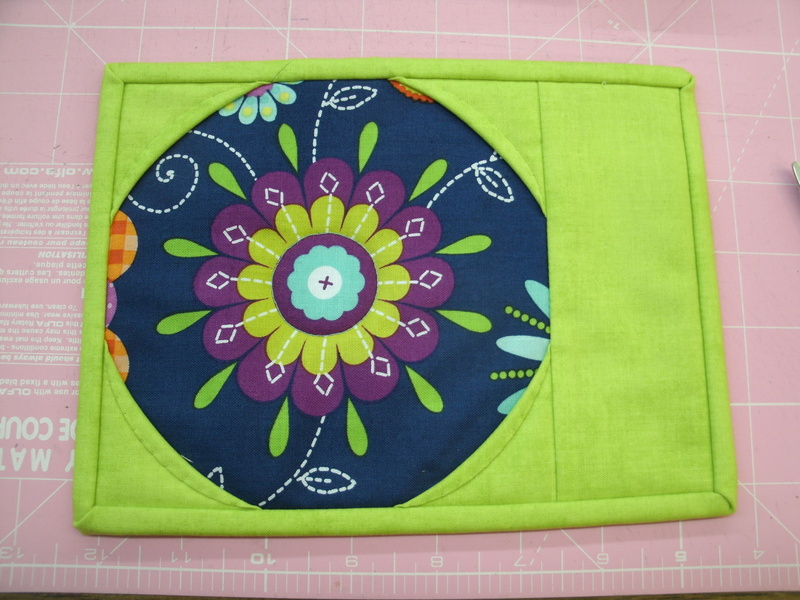 The challenge is to make a mug rug, which will be traded with another participant. For the backing and batting, I had a couple of pieces of fabric backed with fusible fleece left over from another project. These are about 8″ x 10″. The mug rugs finished at 6.5″ x 8.5″. 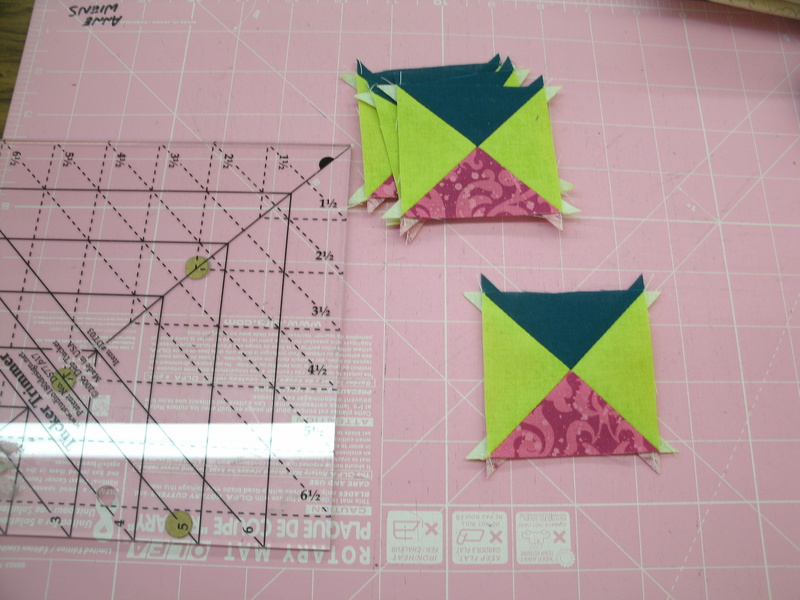 Step one is to make the four quarter-square triangles (QSTs) for the star-point units. I like to use my Tucker Trimmer(tm) for this step. 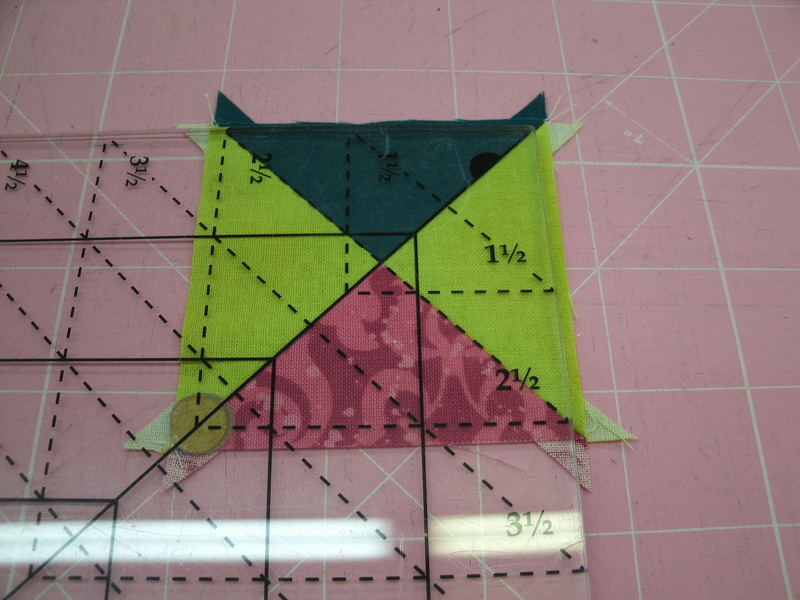 Since our finished QST will be 2″ square, we add 1.5″ and begin with 3.5″ squares. Use your favorite method to make the QSTs as shown above. These QSTs are larger than they need to be, so we will trim them down. Lay the Tucker Trimmer on the QST so the solid diagonal line is on the SW-NE seam, and the dashed 2.5″ diagonal line is on the NW-SE seam. Notice that the lower and left edges of the QST extend beyond the 2.5″ vertical and horizontal lines on the ruler. Trim the right and top edges. Now rotate the QST and line up the Tucker Trimmer again. 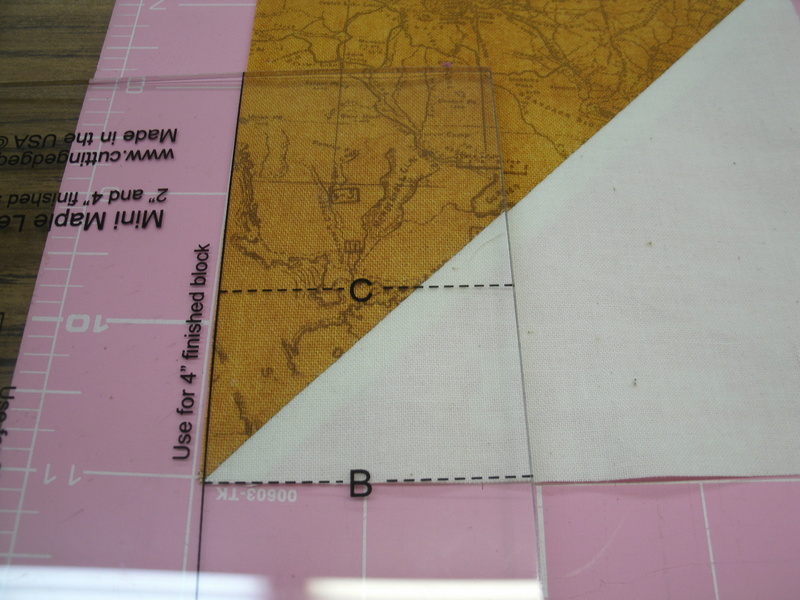 This time, the two edges you just cut should align with the 2.5″ vertical and horizontal lines, and the diagonal lines on the ruler should line up with your seams. Trim the right and top edges. Make four of these units. 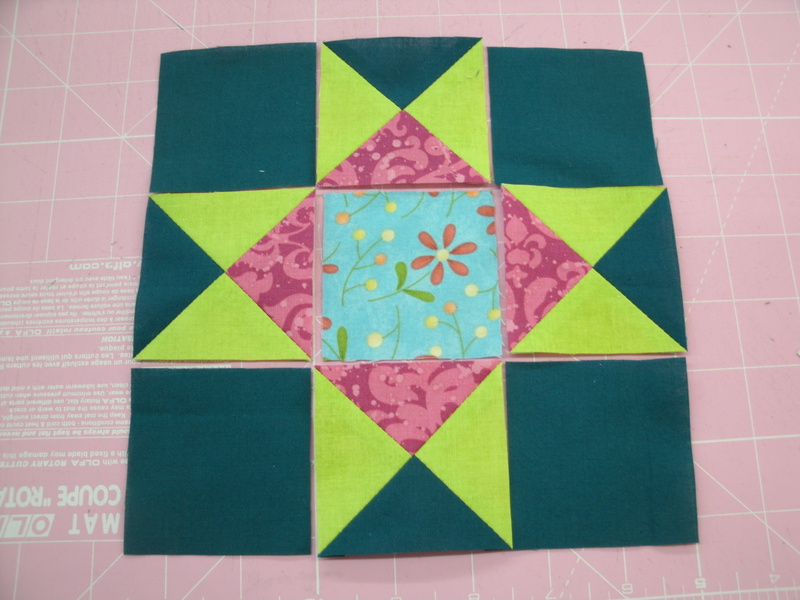 Step 2: Lay out the star point units with the 2.5″ teal and light blue squares as shown above, and sew together to make your 6.5″ Variable Star block. 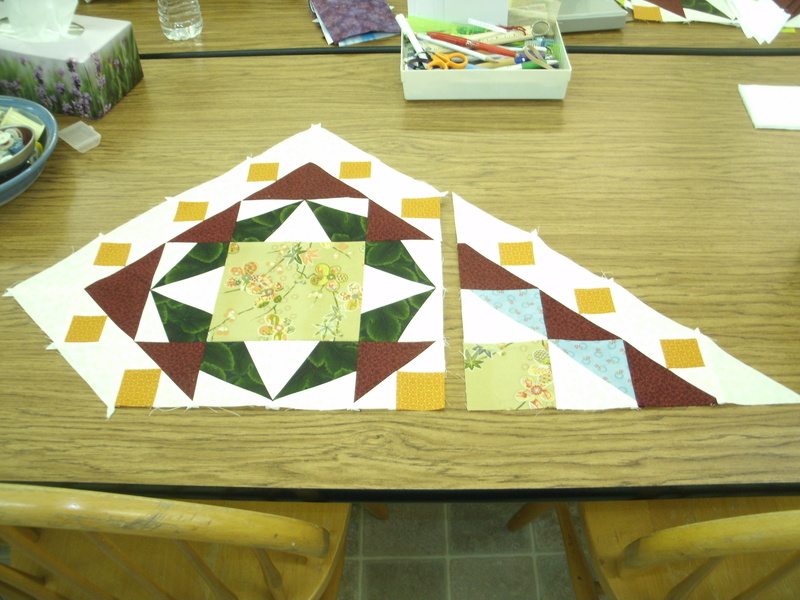 Step 3: We make the curved corners on the star block with a technique called Dimensional Curved Piecing, which I learned from patterns by Annette Ornelas of Southwind Designs. Fold the four orange squares in half diagonally and press. 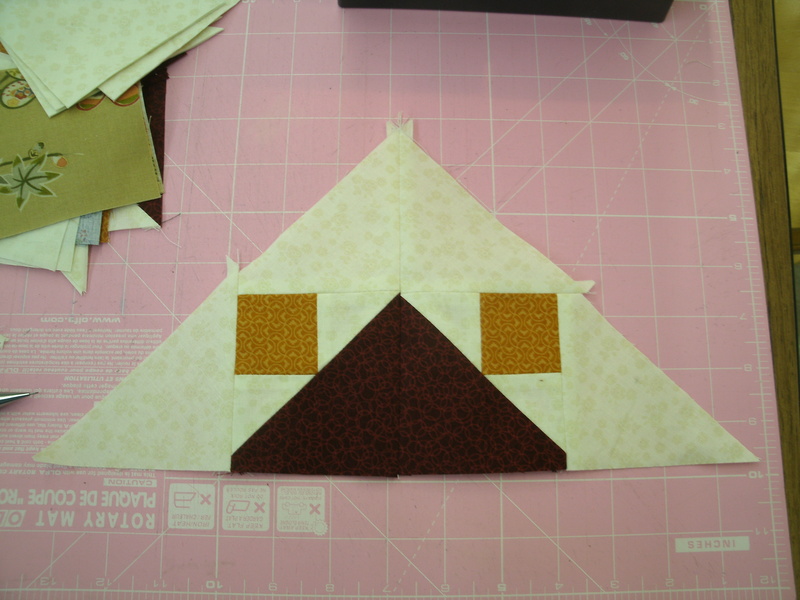 Lay one triangle on the NE corner of the star block and another on the SE corner, aligning the raw edges. 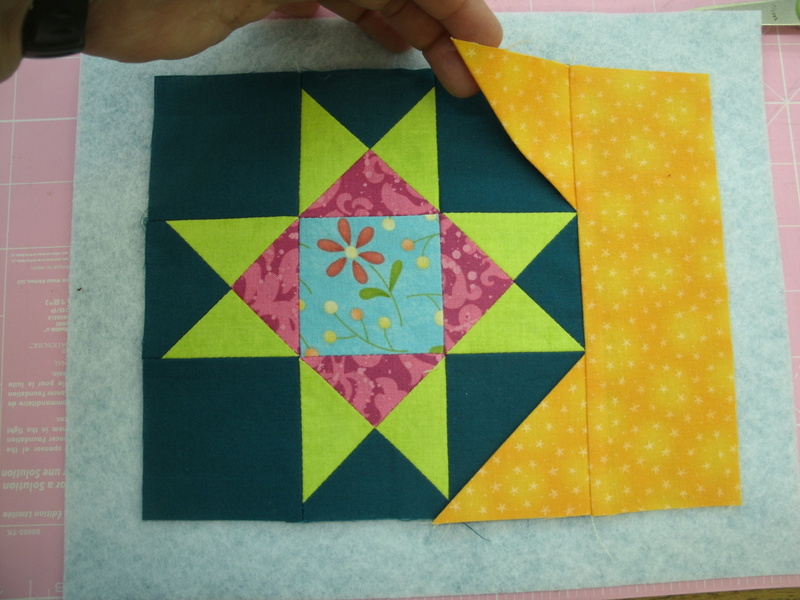 Sew the 2.5″ x 6.5″ orange strip to the right edge of the star block, catching the right edges of the folded squares in the seam. Press the seam toward the orange strip. Step 4: At this point, I pinned the piece to the backing and quilted it. Because this is such a small piece, I used the inside edge of the “toe” of my 1/4″ foot as a stitching guide, running it just along the seam lines. 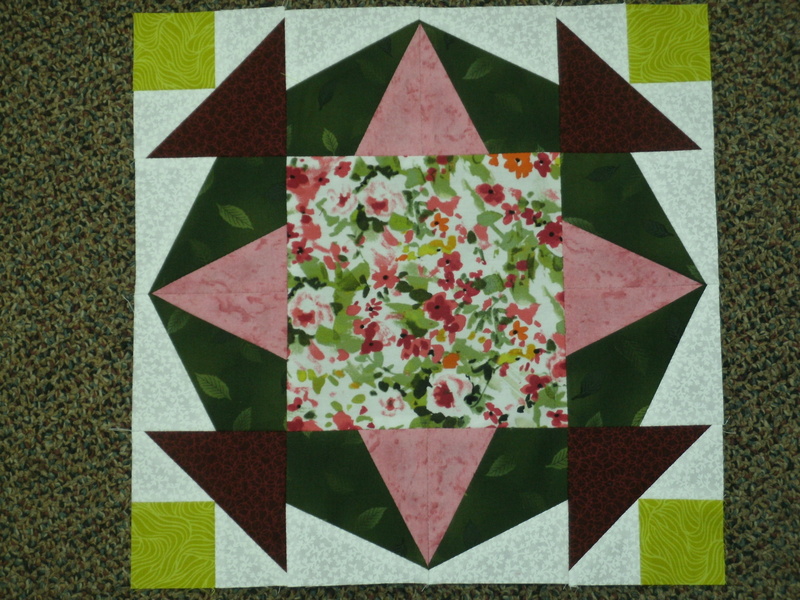 I quilted around the green star points, inside the center square and inside the pink diamond. 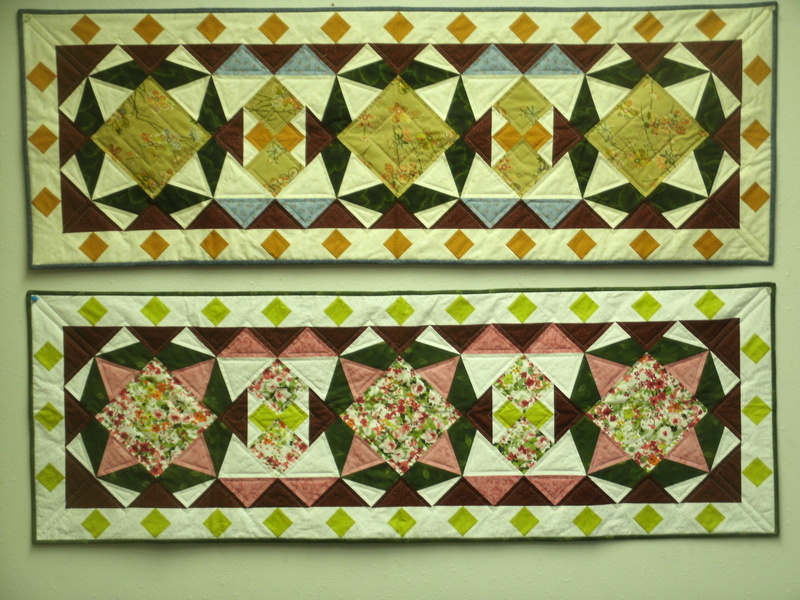 If you look at the upper-left corner of the photo, you’ll notice that I folded the loose orange triangles back onto the orange strip to keep them out of my way while I quilted. When I do straight-line stitching like this, there will be times I can’t carry the line off the edge of the piece. When I have to start and/or stop “in the field”, I leave myself 3-4″ of thread, which I thread into an embroidery needle (the larger eye is easier on my eyes) and bury inside the quilt. No knots, no back-stitching, just a nice, clean finish. Step 5: I hope I don’t confuse you here. 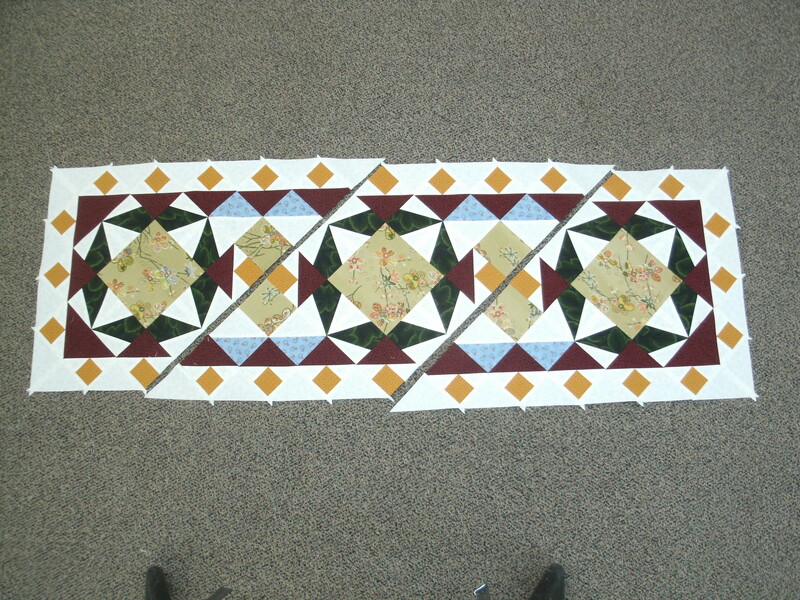 I missed photographing this step, so imagine that in this photo, the piece is quilted. You now trim the backing and batting to match the outside edges of your piece. Fold the NE and SE triangles back over the block corners and pin in place, then pin the last two folded orange squares to the NW and SW corners of the star block. 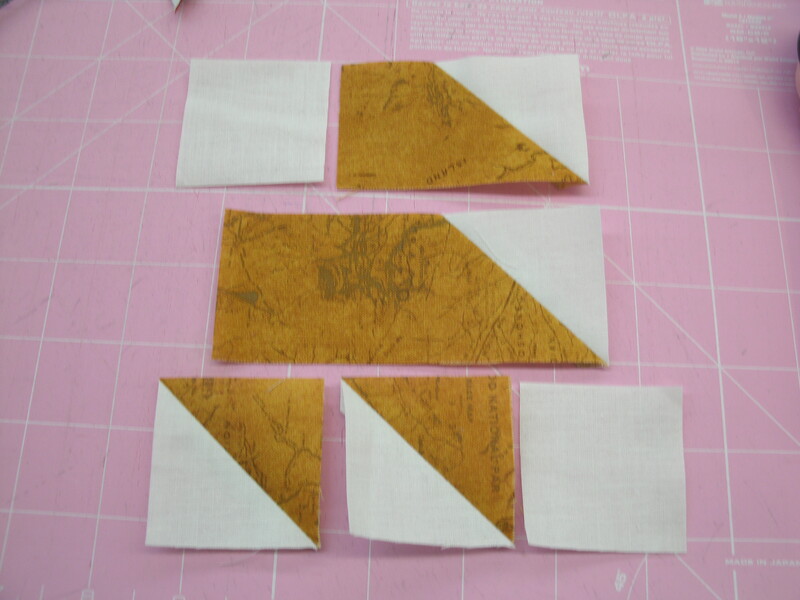 Step 6: Press your 2.25″ x 42″ orange strip in half lengthwise, and sew this binding strip to the front side of your piece, to secure all of the raw edges of the orange triangles. Because the diagonal fold of the orange triangles is on the bias, you can fold this edge back to form a gentle curve. Carefully hand-stitch this edge. You can do it by machine, but personally, I think it’s actually easier and looks nicer sewn by hand. 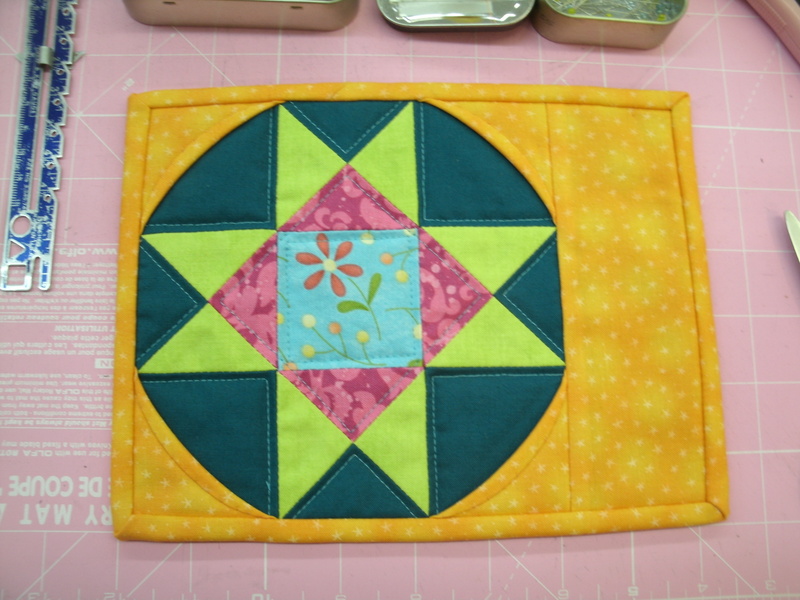 Now you can finish the back-side of the binding to complete your mug rug. This quick project took me approximately four hours to complete. or substitute a 6.5″ fussy-cut of a favorite print!